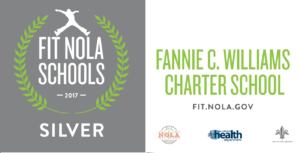 The PTO is a voluntary organization bringing parents, teachers, and community together for activities related to the welfare of Fannie C. Williams Charter School. We organized our first PTA/PTO during the 2011-2012 school year. However, it has not been totally functional since 2013-2014. During the 2017-2018 academic year, Principal Batiste inquired about organizing a Dad’s Club. We’ve been a little more successful with the development of this new organization. “A Few Good Men,” composed of male staff, community leaders and male parents have come forward to develop this organization. Their first activity was a successful Crawfish Boil on the school’s campus in May 2018. We’re seeking dads, grandfathers, uncles, older brothers, community members who are desirous of helping our students and school excel. Contact Art Teacher Phillip Britt with questions and concerns (504.373.6228).